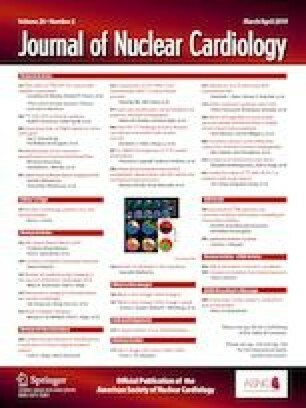 It has been demonstrated that positron emission tomography/computed tomography (PET/CT) is superior to conventional SPECT MPI studies for the diagnosis of CAD and for risk stratification for future cardiovascular events.4 AC through CT enhances specificity and improves image quality. The possibility to quantify myocardial blood flow (MBF) and myocardial flow reserve (MFR) allows the detection of high-risk CAD patients with diffuse and balanced myocardial ischemia. Unfortunately, most of the nuclear cardiology centers around the world do not have access to PET cameras and PET radiotracers due to economic reasons. Recently, the emergence of cadmium-zinc-telluride (CZT) SPECT systems enabled the acquisition of images with a higher number of counts, higher quality images, ultrafast acquisitions, dose reduction, and similar diagnostic accuracy using the same radiotracers that are used for conventional SPECT MPI studies.5 It is also possible to use CZT with CT AC systems to reduce artifacts, mainly in the inferior and inferolateral wall. In the absence of AC, prone position can reduce attenuation artifacts.6 Recently, it has been demonstrated the possibility to measure MBF and MFR with CZT cameras. 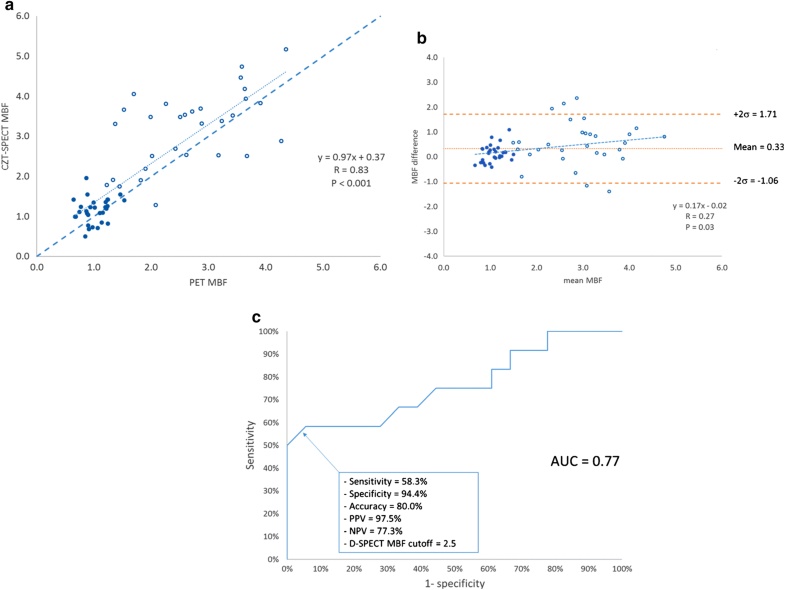 In this issue of the Journal, Hyafil et al compared the diagnostic performance for the detection of myocardial ischemia of 82-Rb-PET-MPS and 99m-Tc-SPECT-MPS with CZT camera in overweight individuals and women.7 Individuals with at least one positive MPS were referred for coronary angiography (CA) with fractional flow reserve (FFR) measurements. In the absence of CA occurrence of acute coronary event during the following year was considered an endpoint. Sensitivity for the detection of myocardial ischemia was higher with 82-Rb-PET-MPS compared to 99m-Tc-SPECT-MPS (85% vs 57%, P < .05); specificity was equally high with both imaging techniques (93% vs 94%, P > .05). Also, 82-Rb-PET-MPS allowed for a more accurate detection of patients with high risk coronary artery disease than 99m-Tc-SPECT-MPS (AUC=0.86 vs 0.75, respectively; P = .04). The difference in sensitivity between 82-Rb-PET-MPS and 99m-Tc-SPECT-MPS could be explained by the use of AC improving the quality of images in the 82-Rb-PET-MPS exams and the possibility of quantifying myocardial flow and coronary flow reserve that allowed the detection of balanced myocardial ischemia in high-risk CAD patients. The fact that no AC was performed in studies with 99m-Tc-SPECT-MPS is a limitation of the study and may have interfered in the results. Multiple studies have assessed the diagnostic performance of CZT-SPECT with CTAC, using invasive coronary angiography as a gold standard. Overall, these studies reported high sensitivities and reasonable specificities; however, the number of patients in each study was limited 8, 9, 10 (Figure 1). Other limitation pointed out by the authors of the study was the absence of MBF quantification using dynamic acquisitions in the CZT-SPECT MPI studies. There are currently softwares that allow the quantification of MBF and MFR with CZT systems, which would certainly increase the sensitivity of the studies. Agostini et al demonstrated the feasibility of myocardial blood flow and flow reserve estimation using a CZT camera in patients with stable CAD in comparison with 15O-water PET and FFR. The sensitivity and specificity were 58.3 and 84.6 for the detection of hemodynamically significant stenosis (FFR ≤ 0.8) 11 (Figures 2 and 3). Recently, De Souza et al also documented the possibility of calculating MBF and MFR through CZT-SPECT dynamic acquisition studies.12 MBF and MFR quantifications using CZT-SPECT need to be included in the routine of centers that use CZT cameras to grow the evidence of its use and improve the results of its application. 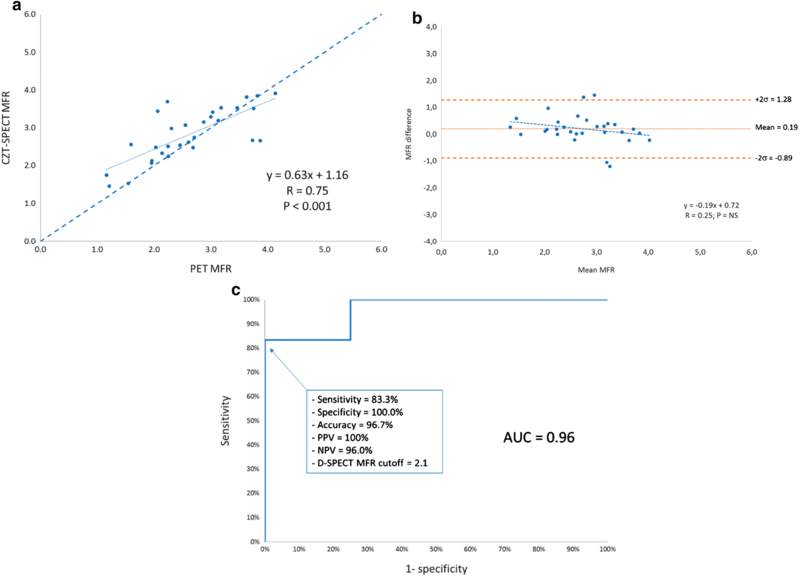 Certainly, CZT flow quantification constitutes a current field of research that will generate knowledge and will enhance the applications of SPECT MPI in CAD. Even without AC and MBF quantification, CZT cameras have very good accuracy in overweight, obese, and women. Gimelli et al evaluated the feasibility and diagnostic accuracy of stress/rest imaging with a CZT camera in obese patients. The authors demonstrated very good or excellent images in all patients (148; mean BMI 39 ± 7 kg/m2).13 De Lorenzo et al evaluated the prognostic value of myocardial perfusion SPECT obtained in CZT cameras in obese patients. Among 1396 patients that were submitted to a single-day, rest/stress imaging, 365 (26,1%) were obese (mean BMI 33.9 ± 3.6). Image quality was good/excellent in 94.5% of the obese patients. The annualized mortality rates were not significantly different among obese and non-obese patients, being < 1% with normal CZT studies and increased with the degree of scan abnormality in both obese and non-obese patients.14 Gimelli et al evaluated gender-related differences in diagnostic accuracy of CZT-SPECT MPI in detecting single and multi-vessel CAD. All patients underwent coronary angiography within 30 days. 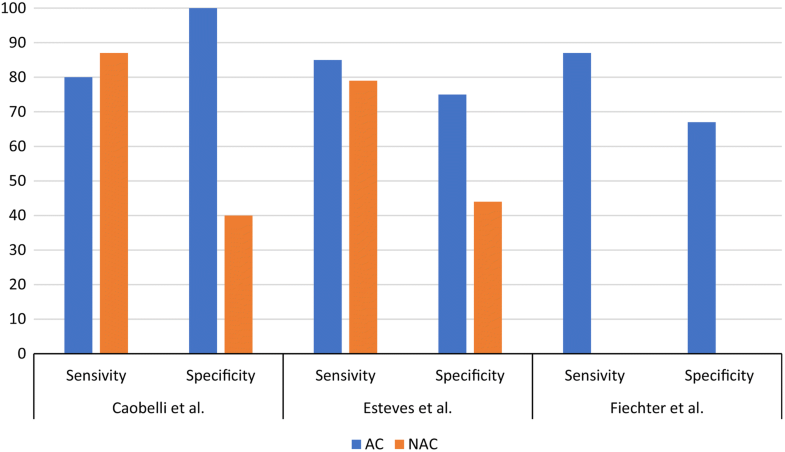 Global SSS was the best predictor of CAD in women (AUC = 0.866, 81% sensitivity and 79% specificity) and in men (AUC = 0.871, 76% sensitivity and 84% specificity). There were no gender-related differences in terms of diagnostic accuracy.15 Although the results of the study of Hyafil et al demonstrated the superiority of PET MPI over CZT-SPECT MPI studies, CZT systems have very good diagnostic accuracy in these subgroups of patients. The use of AC and MBF quantification could help to improve the value of this technology in overweight, obese, and women. It is worth noting that in several countries of the world the availability of cutting-edge equipment such as cardiac PET/CT and CZT is still a rarity. Conventional SPECT MPI is still the most frequent technology in several centers. We must stimulate the realization of nuclear cardiology scans with the best possible quality in these centers, using iterative reconstruction and attenuation correction if possible.